For the discerning client who appreciates a historic and original environment in their horse barn or home. Unique and rugged in appearance, finish and craftsmanship. Post and beam horse barn construction is a classic and enduring style. This is a basic guide to help organize your thoughts as you consider the many options in building your custom horse barn facility. Give us a call at 717-336-0211 if you have any questions or would like pricing on a custom horse barn or riding arena from Kaiser-Martin Group. Timber framing is the method of creating framed structures of heavy timber jointed together with various joints, but most commonly originally with lap jointing, and then later pegged mortise and tenon joints. 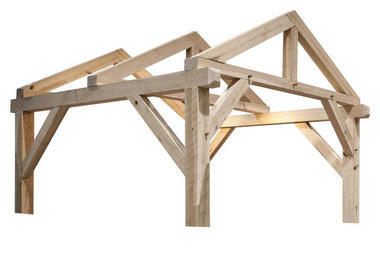 Diagonal bracing is used to prevent "racking", or movement of structural vertical beams or posts. Originally, German (and other) master carpenters would peg the joints with allowance of approximately an inch (25 mm), enough room for the wood to move as it seasoned, then cut the pegs and drive the beam home fully into its socket. Scribing was used throughout Europe, especially from the 12th century to the 19th century and subsequently imported to North America where it was common into the early 19th century. In a scribe frame, timber sockets are fashioned or "tailor-made" to fit their corresponding timbers; thus each timber piece must be numbered (or "scribed"). Square-rule carpentry was developed in New England in the 18th century. It used housed joints in main timbers to allow for interchangeable braces and girts. Today, standardised timber sizing mean that timber framing can be incorporated into mass-production methods as per the joinery industry, especially where timber is cut by precision CNC machinery. To finish the walls, the spaces between the timbers (in German called Fächer) were often infilled with wattle and daub, loam, brick, or rubble. Plastered faces on the exterior and interior were often “ceiled” with wainscoting for insulation and warmth. This juxtaposition of exposed timbered beams and infilled spaces created the distinctive "half-timbered", or occasionally termed "Tudor", style.